Pedro Rebelo has collaborated with our blog from the beginning, suggesting restaurants to try and ideas for posts. He is a fabulous cook. We’re lucky to have been invited to many of his culinary feasts and we love the recipes he shares on his blog, Pasto. Pedro’s food is not just delicious—it surprises and delights. After researching food tours in Italy and France, Pedro teamed up with Franziska Shroeder to organize their own food tour of Lisbon, Portugal on a Plate. They invited us to go on their tour and we gladly accepted. We don’t want to give away their secrets, but we can tell you that the tour is a feast for all senses. We learned about Portuguese food, history and culture surrounded by the sounds of Lisbon: the river Tagus splashing its waves on the shore, the old trams gliding on their tracks, the church bells marking the passage of time. There was so much to see: pristine fish and colorful produce in the farmers market, salted cod and other delicacies in traditional grocery stores, ancient buildings and quaint streets. We experienced the scents of the herbs and spices used in local cooking and the aroma of coffee beans roasted by the last artisanal producer in Portugal. Every few minutes there was a new culinary sensation, from the classics of the Portuguese repertoire to the cuisine of places like Goa, which were once part of the Portuguese empire. There were finger foods like “tremoços” and interesting wines made with passion by small producers. The tour includes an initiation into the art of drinking tea. It was great fun to try the different teas brought from China by Portuguese navigators and introduced to the British court by a Portuguese princess, Catarina de Bragança. You can sample the cuisine of Lisbon on your own. But it is a much richer experience to have insiders guide you to the flavors and aromas of a great culinary tradition waiting to be discovered. Click here for more information about the Portugal on a Plate food tours. It is common for writers to imagine new worlds and share them with us. But it is uncommon for chefs to pursue this creative strategy. José Avillez, the Michelin-starred chef of Belcanto, dreamed of an old Lisbon neighborhood where friends gathered to share great food. He imagined timeworn buildings guarded by carved wooden doors with windows adorned by crocheted curtains. The result is a fun atmosphere perfect to enjoy the classics of Portuguese cuisine, refined and, in some cases, reinvented. Bairro do Avillez (Avillez’s neighborhood) has a grocery store (Mercearia) with some of the chef’s favorite products, a tapas bar (Taberna), and a restaurant (Páteo). In the Taberna, you can eat a wide variety of “petiscos” (the Portuguese word for tapas), from Portuguese prosciutto and sausages, to codfish with cornbread, and roasted piglet. The Páteo offers pristine fish from the Portuguese coast, grilled, cooked with rice, or combined with bread, olive oil and garlic in a fragrant “açorda.” The menu also includes great seafood (lobster, shrimp, clams, crab, and razor clams), delicious steaks, and grilled black pork from Alentejo. There’s a wonderful house wine made in collaboration with Quinta do Monte d’Oiro. And there is also a great new line of artisanal beers called Selection 1927. Chef José Avillez is a dreamer who makes Lisbon more fun with his gracious demeanor and delicious food. It is a privilege to be in his neighborhood. Bairro do Avillez is located at Rua Nova da Trindade, 18, Lisbon, tel. 215 830 290. Casa de Pasto was the designation given to humble restaurants that served comfort food to country folks, making them feel at home when they visited the city. 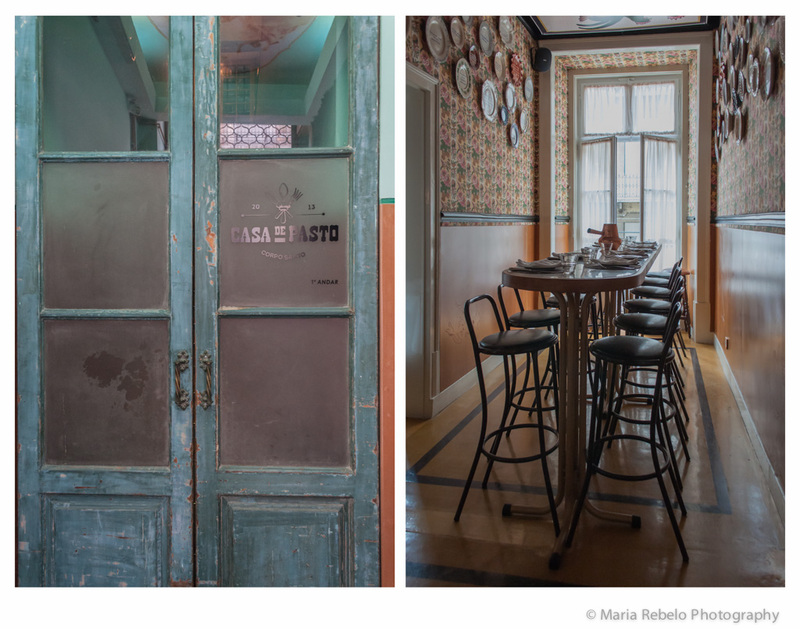 So, it was with low expectations that we walked up the stairs of a Lisbon restaurant called Casa de Pasto. We were greeted by an exuberant decoration that combines ceramics and artifacts sold in country fairs with a deft sense of design. The food was a revelation. First, a gazpacho so intense that it could make a Spaniard blush with pride. Then, the freshest sea bass, perfectly grilled, the kind of delight that you can only enjoy in Portugal. Next, we shared a grilled veal T-bone steak, so large and succulent that it would bring tears to the eyes of a Florentine. The meal’s ending was a chocolate mousse so perfect it could convince a Belgian to move to Lisbon. Casa de Pasto is a restaurant with wonderful food that makes everyone feel at home. Casa de Pasto us located at Rua de S. Paulo 20, Lisboa, tel 963 739 979. Click here for their website.